The flight is one of three Falcon Heavy missions that could blast off in 2018, after a successful maiden test flight Feb. 6 and the launch of an Arabsat communications craft around the end of the year. Known as the Space Test Program-2, or STP-2, mission, the Falcon Heavy launch will launch with 25 spacecraft inside its nose cone, according to a spokesperson from the U.S. Air Force’s Space and Missile Systems Center. 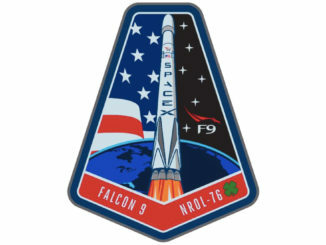 The Air Force reserved the STP-2 launch on SpaceX’s Falcon Heavy rocket in December 2012. At the time, officials said the mission would lift off in 2015, but the target launch date is currently no earlier than June from pad 39A at NASA’s Kennedy Space Center in Florida. Officials working on the mission said SpaceX has provided the Air Force and other customers a 60-day window for launch opening on June 13. The Air Force spokesperson confirmed it will be the second Falcon Heavy mission. Difficulties in developing the Falcon Heavy, which SpaceX founder Elon Musk considered said the company considered canceling multiple times, pushed back the heavy-lifter’s inaugural test flight to 2018. The demo mission Feb. 6 went off without incident, alleviating concerns about the Falcon Heavy’s structural integrity and the performance of 27 main engines from its three boosters firing in unison. 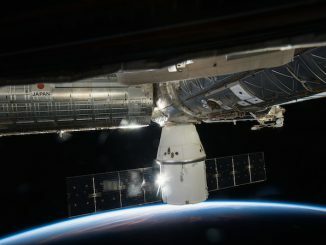 SpaceX also demonstrated a long-duration coast of the Falcon Heavy’s upper stage, which reignited around six hours after liftoff to send the mission’s whimsical payload — a Tesla Roadster carrying a spacesuit-clad mannequin dubbed Starman — on a trajectory escaping Earth’s gravitational influence and into the solar system. Formed by clustering three Falcon 9 rocket stages together, combining 27 main engines to generate around 5 million pounds of thrust, the Falcon Heavy is the most powerful rocket currently flying in the world. 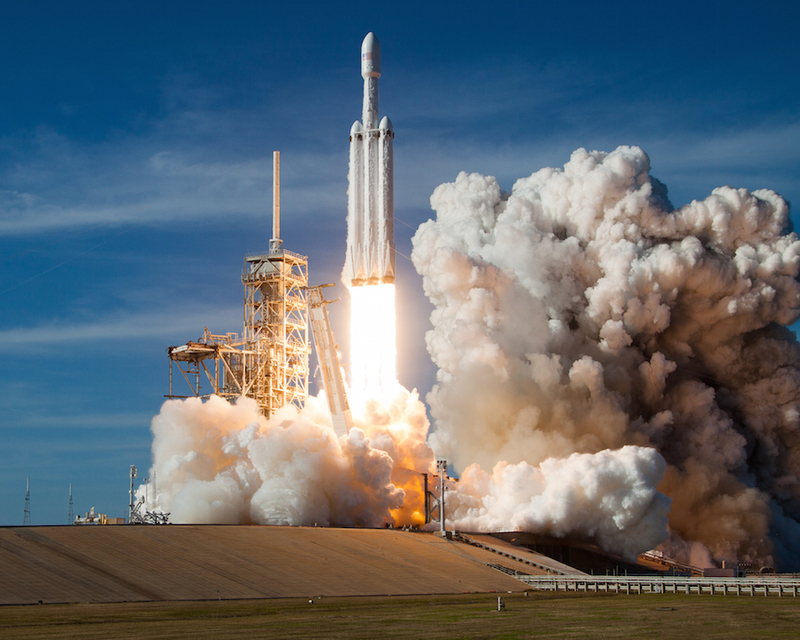 Customer payloads will ride on future Falcon Heavy rockets, beginning with the Air Force-managed STP-2 mission, slated to loft small satellites for government and university builders and operators. Passengers aboard the STP-2 flight include six weather research satellites — each weighing less than 500 pounds (225 kilograms) — part of the Constellation Observing System for Meteorology, Ionosphere and Climate-2, or COSMIC-2, program. 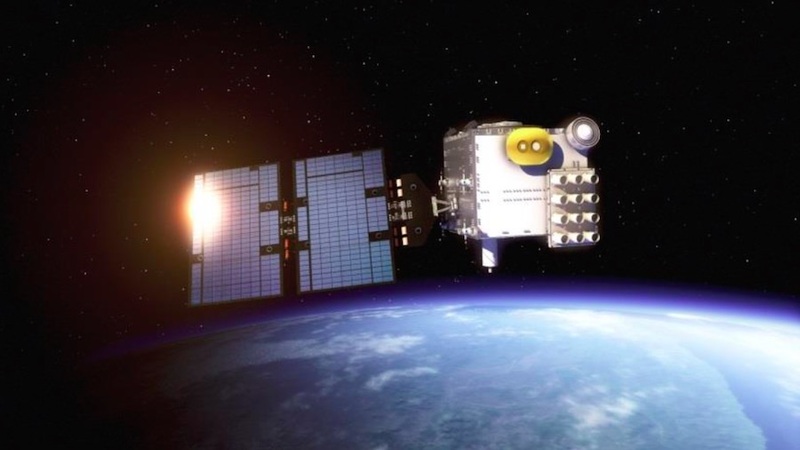 The joint U.S.-Taiwanese COSMIC-2 program is a follow-on to six microsatellites launched in 2006 to measure temperature and humidity conditions in the atmosphere by monitoring the attenuation of GPS navigation signals. The measurements will be fed into numerical prediction models used by forecasters worldwide. NOAA and the Taiwanese government have partnered on the COSMIC-2 program, also known as Formosat 7. Other satellites slated to fly on the next Falcon Heavy include the Air Force Research Laboratory’s Demonstration and Science Experiments, or DSX, spacecraft. 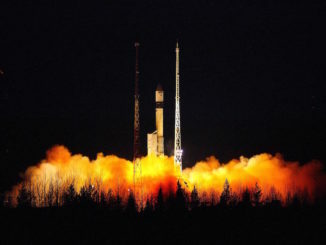 The half-ton DSX satellite will fly through Earth’s radiation belts with instruments to measure the effects of very low frequency radio waves on space radiation, space weather conditions and the impact of radiation on electronics and spacecraft materials. 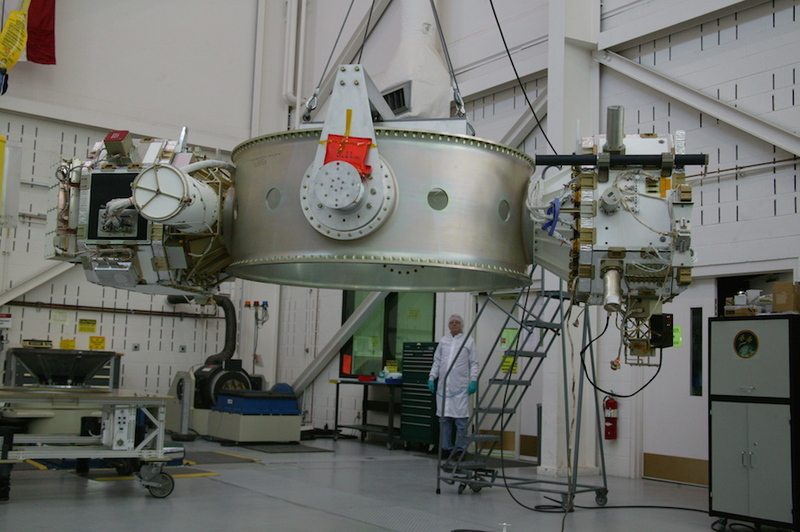 NASA’s Green Propellant Infusion Mission, an experimental craft built to test the performance of a non-toxic fuel for future satellites, is also on the STP-2 launch. The commercial Orbital Test Bed satellite developed by the U.S. subsidiary of Britain’s Surrey Satellite Technology Ltd. will also launch, hosting several commercial and military experiments, plus a NASA-funded ultra-precise atomic clock that will validate a new device to aid the navigation of future deep space missions. Numerous other small satellites are also booked to fly on the STP-2 mission. The roster includes Prox 1, built by Georgia Tech students to test out a 3D-printed thruster and a miniaturized gyroscope, and satellites from the U.S. Air Force Academy, the Naval Postgraduate School, the Naval Research Laboratory, the University of Texas at Austin, Michigan Tech, Cal Poly, and a CubeSat assembled by students at Merritt Island High School in Florida. Some of the 25 spacecraft launching on the Falcon Heavy’s second flight will spawn sub-satellites, splitting apart or deploying secondary payloads once away from the SpaceX launcher. For example, Prox 1 will eject the Planetary Society’s LightSail 2 CubeSat, a follow-up to a solar sail demo conducted in 2015. The Falcon Heavy’s second stage will ignite at least three times on the STP-2 mission — and possibly more — to place the satellites into two different types of orbits. Most of the STP-2 payloads will go into circular low-altitude orbits around 447 miles (720 kilometers) above Earth, inclined 24 degrees to the equator. Then the Falcon Heavy will boost the DSX satellite into an unusual elliptical orbit ranging in altitude between 3,728 miles (6,000 kilometers) and 7,456 miles (12,000 kilometers), with a ground track shifting between 43 degrees north and south of the equator. The complex mission will mimic the multi-burn profile used by the Falcon Heavy’s second stage on the Feb. 6 test flight, but the satellites — most of which weigh a few hundred pounds or less — will not max out the Falcon Heavy’s lift capability. The STP-2 launch will a set a record for the highest number of satellites on a SpaceX mission, but other rockets have delivered more spacecraft to orbit on a single launch. The current record is 104 satellites, which rode to orbit on an Indian Polar Satellite Launch Vehicle in February 2017. The Air Force’s contract with SpaceX for the Falcon Heavy/STP-2 launch was valued at $165 million at the time of its signature in 2012. Like last month’s test flight, the STP-2 mission is expected to count toward the Air Force’s certification of the Falcon Heavy to haul national security satellites into orbit. The military payloads on the STP-2 flight are experimental, and the Air Force wants to see more successful Falcon Heavy missions before committing to launch more expensive classified surveillance platforms on SpaceX’s mega-rocket. The Air Force’s certification of the Falcon Heavy could come after as few as two successful flights, or as many as 14, including an extensive technical review of the rocket’s design. Elon Musk, SpaceX’s founder and CEO, said the Falcon Heavy could be ready to launch national security payloads within a few years. Musk said the next Falcon Heavy launch — the STP-2 flight — will use three upgraded “Block 5” Falcon rocket boosters. The Feb. 6 test launch flew with a mix of Block 3 and Block 4 boosters, and the Block 5 design — featuring upgrades for reliability and reusability — is set to debut in April on a single-stick Falcon 9 launch. “Hopefully it’s smooth sailing for qualification for national security missions,” Musk said. The third Falcon Heavy launch is scheduled to loft the commercial Arabsat 6A communications satellite, a Lockheed Martin-built spacecraft owned by a Saudi Arabia-based company that is set for delivery to Cape Canaveral by the end of the year for final launch preparations. Two other companies, ViaSat and Inmarsat, are also signed up for Falcon Heavy missions. Both operators moved previous satellites off the Falcon Heavy, one to a Falcon 9 and the other to Arianespace’s Ariane 5, after the heavy-lifter ran into lengthy developmental delays. But ViaSat and Inmarsat kept their agreements with SpaceX to launch future satellites on the Falcon Heavy. Musk said there are no plans to fly people on Falcon Heavy rockets. SpaceX is working in an even bigger rocket for humans, the Big Falcon Rocket, or BFR, that the company claims could begin orbital test flights in the early 2020s. A plan to send two-person team of tourists on a flight around the moon and back to Earth on a Falcon Heavy rocket has been shelved for now, he said.